My favorite food to enjoy in the fall and at the holidays is a moist, delicious stuffing. Mrs. Cubbison’s has elevated stuffing to new levels with the addition of their latest offering, Multi-Grain Stuffing with Cranberries. My husband is extremely particular about his stuffing brand (which is filled with MSG and a lot of sodium so I will only serve it on rare occasions) and he does not like it at all when I try a new product. Therefore, he reluctantly took a bite of the new Multi-Grain Stuffing with Cranberries from Mrs. Cubbison’s and after a moment he declared it “absolutely delicious.” My entire family, including the children really enjoyed eating it because it tastes wonderful. As a mom, I appreciate that it is all-natural with no artificial ingredients and includes healthy multi-grains and toasted cracked rye and wheat. 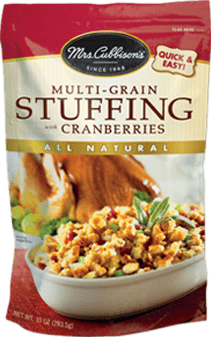 This stuffing is bursting with sweet and tart dried cranberries and it really sets this stuffing apart from any mix that I have ever made in the past. It is very simple to prepare and a filling, tasty side dish at dinner. I will definitely be serving this for our family gathering at the holidays too! When I serve a salad, the kids really like it to have a crunch so I like to use croutons. Mrs. Cubbison’s has a full line of all-natural croutons including Classic, Garlic & Butter, Caesar Salad, Cheese & Garlic and Fat Free. I really like how these croutons taste so freshly baked and crispy. I also like that these are naturally flavored and I actually “caught” my husband and kids enjoying these together straight from the bag as a snack with a piece of cheese……hmm, not such a bad idea after all! I have never been a fan of Green Bean Casserole because I normally don’t care for the fried onion topping. However, that has since changed when I made a delicious casserole using fresh green beans from our organic garden and all-natural Crispy Onions from Mrs. Cubbison’s. This product is made using fresh onions and it does not have a greasy or oily after-taste. I used the recipe for Green Bean & Mushroom Casserole with Alfredo Sauce that I found at the Mrs. Cubbison’s website (check out all of the free recipes) and it is even a hit with my six year old son who previously declared onions on his “do not like to eat” list. If you are looking for inspiration for holiday recipes, I highly recommend reading Mrs. Cubbison’s Best Stuffing Cookbook. It is a great way to learn how to prepare the most delicious stuffing recipes and it is packed with creative and tasty ideas from around the world. For example, did you know that you could make muffins from stuffing? I am going to have to try this recipe soon. This cookbook has over 100 recipes that have already given me some really good ideas for entrees and side dishes and I can’t wait to create even more for dinner. Overall, I am really impressed with Mrs. Cubbison’s who has been a pioneer in the food industry for over 60 years. What makes this product line such a stand-out for me is that it uses natural ingredients and the resulting dishes tastes fresh and delicious with not a lot of effort. I am so pleased to have discovered this product line so that I now have quick meals options that will please my entire family. You are invited to visit Mrs. Cubbison’s to learn more about all of the tasty products available and don’t forget to check out those recipes too. I would love to make stuffed peppers with the stuffing mix! i would create a yummy meal for my family! I would make a salad with the croutons and dried fruits. I’d probably do a stuffed chicken or duck with the prize. I’d make a stuffed chicken breasts. Thanksgiving stuffing for the turkey and green bean casserole. I would use it for Thanksgiving dressing. I have never tried dressing with dried fruit before but it sounds yummy! I would create a wonderful thanksgiving dressing that could be passed down for generations! I would try making the Bacon-Topped Stuffing Lamb Chops on their site. Sounds yummy! 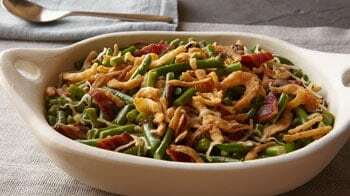 I would create a green bean casserole for Thanksgiving. Honestly, I wouldn’t create, I would talk my mom into doing it for me…. I’m a horrible cook! I would make this casserole that my sister used to make with stuffing mix and chicken breasts and cream of chicken soup…. I would make a great turkey dinner with stuffing, and green bean casserole. I would create one of the Best meals my family has ever tasted. I would make my mother in law’s chicken casserole. I would make a nice stuffing with it. For sure I would make The Cranberry Stuffing white white turkey breat & I use cream of chicken instead of water…….top with Celery & green oinons! I would create stuffing and cranberry sauce.